Tiger Leaping Gorge – this was why I had come to Lijiang and now we had finally made it to the start of the trail. I was anxious to begin. Harry and I had taken a bus in the morning with some fellow hikers (Germans, French, Dutch, Spanish) and arrived in Qiaotou, a small mountain village, two hours later. A Korean group had chosen to ride horses on the Upper Trail, a 22km (14 mi.) trail that snaked its way through the mountains, thousands of feet above the Jinsha River that cut through the gorge. We followed the quadrupeds and carefully sidestepped the brown droppings they left behind. At first we were on a village road and then suddenly we saw a thin, brown trail winding its way up the mountain. We had arrived at Upper Trail. It was a steep ascent, but the view was awesome. We could see the bluish green waters of Jinsha River weaving their way through sheer mountain cliffs that were thousands of feet high. At various spots along the way, the locals had set up food stands. You could buy a Snickers bar, an apple, and some water. If you needed to destress, apparently marijuana was an option too. I’ll leave that for the hippie hikers. After the trail had leveled out, we walked down into a village with houses near the trail and terraced farmland rising up to the mountain peaks. Another idyllic spot for a summer cabin. After the village, the dirt path became a concrete trail that wound back up the mountain. We briefly rested at an abandoned food station that told us to get refueled before the 28 Bends. The 28 Bends were quite literally 28 bends in the trail that progressively got steeper and higher as you hiked up them. By the time we reached the top, it felt like at least 100 bends. We were greeted by a friendly, middle-aged woman who had set up her food station quite strategically. She told me she hikes up the trail every day to sell food and drinks. I was impressed. There must be some special minerals in the village water or mountain genes that get passed down the family tree. 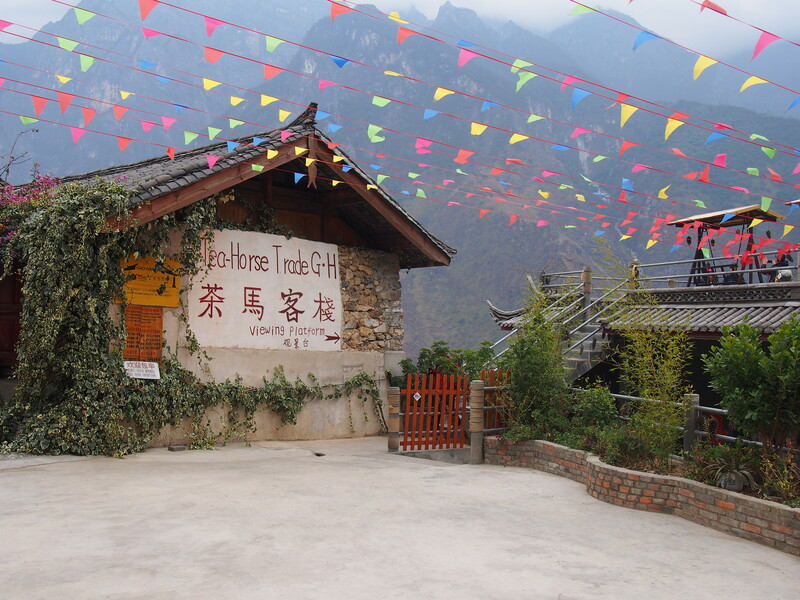 After five hours of hiking, the trail began to head down to the Tea Horse Guesthouse, a hostel 2,500 m (8,200 ft.) high with views of snow-capped peaks across the gorge. This was a true alpine paradise. At first clouds had obscured the top peaks, but as they began to dissipate, I could see the jagged, snow-capped peaks pierce through the clouds. Dinner could wait. At the restaurant, Harry and I ordered some yak meat, egg and tomato soup, and Tibetan butter tea (the salty aftertaste was an unpleasant surprise). The Koreans had ordered some whole chickens and ducks for their own feast. We kept the two cooks busy. After dinner, we did some star-gazing on the upper deck until the icy winds blew us back inside. The heating pads and thick comforters on our beds were greatly appreciated. Even with paper thin walls and some noisy neighbors, we fell asleep fast. Hi Paul. Duffee showed me your blog and I enjoyed looking at it. Give me an email when you get a chance. I had a question for you. I’ve missed the trip. XD we should do it again. It was a great trip. That would be fun to have another memorable hiking trip in China.